Retirement years are referred to as the “Golden Years” for a reason – your retirement is among the most exciting phases of life. It is finally time to put your comfort and relaxation at the forefront of your decision-making process. The first thing you’ll need to do is research your top cities. Nashville, TN definitely needs to be on your list. It is a fun, smart, healthy choice – all in one. According to WalletHub’s 2018 tax burden rankings, Tennessee has the 3rd lowest tax burden in the entire country, making Nashville one of the most tax-friendly places to live for older adults. Tennessee is one of the few states in the US that does not tax wages, so you can keep more of what you earn if you plan on continuing to work. Down the road, you will also be able to stretch your fixed retirement income further. Public and private pensions are also not taxed. Seniors who live in Nashville are also eligible for property tax relief if they meet certain income requirements. For seniors making less than $41,780 per year, you can freeze your property tax rate at whatever the rate is at time of purchase. Currently, the Davidson County property tax rate is $3.155 per $100 of assessed value in the Urban Services District and $2.755 per $100 in the General Services District. An agent on our team can help you determine which district your new home would be in. Nashville is known for having many things to do, but the city also has recreational activities geared specifically for seniors and attractions that often offer senior discounts. The music scene, in particular, is unparalleled – featuring iconic music venues such as Grand Ole Opry, Ryman Auditorium or Bluebird Cafe. On any given night you can head over to Broadway and hop between the various different bars and restaurants to see top-tier entertainment. The Nashville area offers many different activities for retirees with an appreciation for the great outdoors. Percy Priest Lake, Percy Warner Park, Cheekwood Botanical Gardens and Radnor Lake are just a few nearby places where you can enjoy fresh air, hiking, swimming and a multitude of other outdoor activities. There are also senior centers in the city that offers plenty of things to do. Senior centers, funded by the Greater Nashville Area Agency on Aging, can serve as a place for you to go for ongoing recreational and social activities, including exercise, creative art and cooking classes. Senior centers are a great place to explore a new hobby and meet new friends. Beyond recreation, these centers also typically offer educational opportunities for retirees in several different subject areas, such as health and wellness, tax preparation services and computer classes to stay sharp. Access to healthcare is an important factor that older adults need to consider when choosing where they’d like to retire – especially if they have chronic diseases or other ailments that require ongoing management. Nashville offers many hospitals and healthcare centers for seniors to choose from. The city’s three biggest health-care providers – Vanderbilt University Medical Center, HCA TriStar and St. Thomas Health – have earned national accolades for their high level of patient care and safety. Beyond being accessible and of high quality, medical care is also affordable in the state. According to the Kaiser Foundation, Tennessee residents spend about $6,411 per capita on health care, below the national average of $6,815. Inpatient hospital care is about $1,462 a day versus the national average of $1,910. Although your happiness should be at the top of the list of things you consider, it’s important to remember you will likely require different living arrangements as you continue to age to accommodate for changing health and mobility needs. Most senior living options in Nashville are built according to universal design principles. Universal design homes and communities are facilities designed and built with the changing needs of seniors in mind. Examples of amenities found in these homes include no step entryways, one story floor plans, wider doorways, open floor plans with extra floor space and bathrooms that are senior-friendly. These may not be amenities you need right now, but it’s always smart to plan for the future. If you wish to maintain as much independence as possible and buy a home without having to deal with the hassle of maintaining a home, an active adult-living community could be a great choice for you. Adult-living communities, also referred to as “55-plus” communities, offer many amenities – such as pools, fitness centers and transportation options. Living in one of these communities often requires extra fees, so make sure to consult with us about what you can expect cost-wise. In addition to active adult communities, there are many senior and assisted living options in Nashville and 25 more in the surrounding area. Assisted living facilities are a great option for seniors who need help with activities of daily living – which can include bathing, dressing, managing medications and keeping up with general housework. 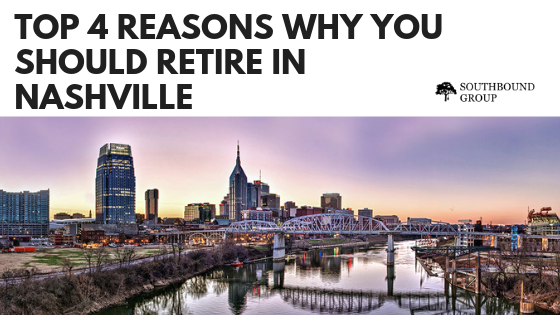 We hope that you found our list of reasons why Nashville, TN is a wonderful place to retire helpful. These years are the “golden years” and we want you to live out your life is a place where you can stay happy and healthy. If you are looking to make the Nashville area your future home, contact us!